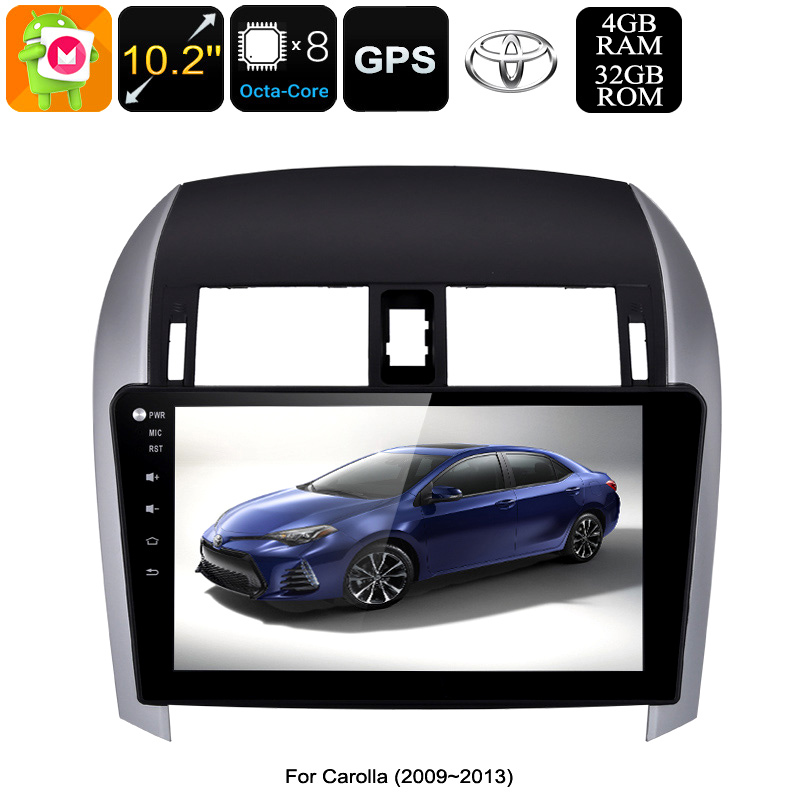 Successfully Added 2 DIN Car Stereo Toyota Corolla - Octa Core CPU, 4GB RAM, 10.2 Inch Touch Screen, CAN BUS, GPS, Bluetooth, Android 8.0.1 to your Shopping Cart. Powered by a Rockchip octa-core CPU, 4GB RAM and a PowerVR GPU this top of the line 2 DIN car stereo offers you a seamless performance and can handle all you throw at it. Boasting a 10.2-inch screen with 1024 x 600 resolutions makes for great viewing, so the user interface and GPS maps are bright and clear. With Android 8.0.1 running in your car you can use voice commands through OK Google for finding local businesses, or sights of interests. The Play store offers plenty more apps to enhance your experience and with Bluetooth connectivity, you can enjoy hands-free calls when synced to your smartphone. CAN Bus support lets your steering wheel controls work for with this car stereo faultlessly and with WCDMA dongle compatibility you can even enjoy cellular data connections for surfing the web while on the go. If you own a Toyota Corolla you'll be well aware of how reliable the car is. It starts up every morning without fail and takes you from A to B without any added drama. But if you still have the factory radio you should really consider an upgrade. Get rid of that old AM/FM in-dash stereo and equip your Corolla with a sound system that will turn your morning commute into a joy rather than a drag. After all, the car in front should have an Android media player and navigation system to keep it ahead. Best of all, replacing the 2Din car stereo on your 2009 to 2013 Corolla is quick and easy, and upgrading the radio is a great way to maximize the car's entertainment system. So there really is no reason not to put a touch screen car media player in your Corolla and make this enormously popular car even better. This 2 DIN car stereo comes with 12 months warranty, brought to you by the leader in electronic devices as well as wholesale car media players and automobile gadgets..